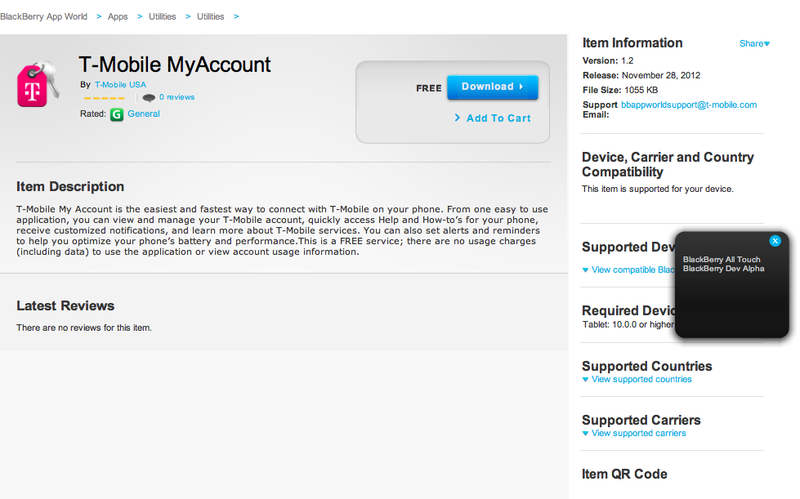 If there was ever any question whether T-Mobile would support RIM’s upcoming “10” OS, let the introduction of a new MyAccount app in Blackberry App World put any debate to rest. This new version of T-Mobile’s account management app was added this past Wednesday and requires “Tablet: 10.0.0 or higher.” RIM has gone on record as saying they have Blackberry 10 already in the hands of at least 50 carriers around the world and now it’s evidently clear that T-Mobile USA is one of the 50. Not that we doubted it for a minute, but it’s always good to see that little extra bit of confirmation. I’ll be the first to admit that I have a bit of a soft spot for my Blackberry Pearl and I would love to see Blackberry regain some of its former glory, but I’m just not sure if that’s possible no matter how amazing their upcoming “10” OS will be. Do you think Blackberry can find its former glory? The should find some glory. . .no way they are getting it all back. . .but RIM will be alive and kicking for the next 5-10 year for sure. . . Despite my love for the Note 2, I WILL be getting the Blackberry 10 on T-Mo. The one thing I can say for Blackberry is that no matter how antiquated their OS’s get (I AM so looking forward to the 10! ), their phones are built to last. I swear these things can take a licking and keep on ticking. I’d definitely keep both. It will be interesting to see which I choose to be my daily driver though. I think the Storm 2 is the only phone I’ve ever kept longer than 6 months (8 months to be exact) because I liked it so much at the time. I’m waiting “With Arms Wide Open” as well. The announcement on January 30 will be more than anyone knows. It’s not just a new phone launch. I can’t blame people for the reasons they believe what they believe, but they just don’t know what’s coming. It’ll be jaw dropping. Agreed. I know three people along with myself that are dumping iPhones and getting BB10. I agree that it will be jaw dropping. We are officially going from mobile phones to mobile computers with the new OS. I, too, have money invested in RIM because I believe. What is this “Blackberry” that they speak of? Can’t wait. I love blacberry’s!!! Please get it out soon! I hope they release it on T-mo and it’s not going to be an exclusive for AT&T for like 6 months. I’ll go crazy. Wow! So good to see all positive remarks about RIM/BB10. It’s been a long time coming. I think the Apple and Android dominance will continue for years to come. I think BB10 will be an outstanding and amazing mobile computing platform. For now the most part anyone else besides Apple and Android no matter how good won’t become a significant #3 player for years if ever. They are both just too strong. But I also believe that BB10 has the best shot at #3 of all other OS’s out there at becoming “the next big thing” – for REAL. Personally I and my wife are looking forward to getting a BB10 ASAP. I also have a soft spot for my Pearl. And my 8900. And my 9780. And my PlayBook. Looking forward to having a soft spot some years from now for my first BB10. Go RIM!! !